The Palais des Rois de Majorque is a must-see if only for the fine view from the impressive red brick ramparts across the city roofs to Canigou, to Queribus and the plain in between. It is made up of a succession of citadels starting in 1276 as a residence for Jaume II of Majorca, on to Louis XI in 1475, Charles Quint in 1535, Philippe II in 1564 and finally fortified by Vauban for Louis XIV in 1679. It contains a beautiful chapel, some rather austere royal apartments and a grand courtyard. At one stage wild lions roamed the moat. They are no longer there; in fact in summer, there are often free concerts to be enjoyed within its walls. 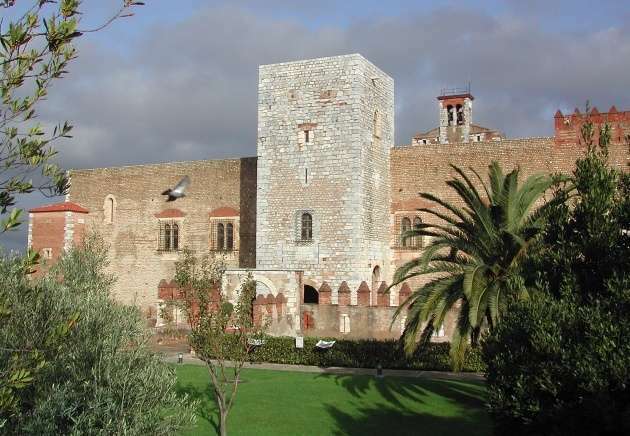 An entire quarter of the old town in Perpignan is taken up by the Palais (04 68 34 48 29). The entrance today is as circuitous as when it was designed in the 13th century to keep out attacking armies. Flights of steps zig zag within sheer redbrick ramparts until, eventually, the elegant gardens and substantial castle are reached. A superb palace, in the heart of the city. From the impressive Tour de l’Hommage the commanding view over mountain, plain, city and sea is a great introduction to the city. The surrounding convents, churches and the cathedral bear witness to the religious fervour of the Kings of Mallorca, the green parks and gardens cool and peaceful between the warm red bricks of the ancient buildings. The angles of the walls and windows of the Palace are cut from the pink, blue, red and white marbles of the Pyrenees Orientales. The vast two story arcaded courtyard, the frescoed and tiled royal chapel and the great Gothic Hall display a strong Spanish Moorish influence. A tour of the two chapels, the Royal apartments and grand halls that surround the central courtyard gives an insight into the palace life as it must have been lived in medieval times.